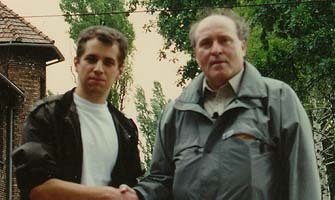 This young Jewish Revisionist filmmaker (in the photo on the left) came to the defense of Ernst Zündel (on the right) when Zündel needed defending. Subsequently, Zündel and Cole made a film in Auschwitz, with David Cole pointing out many of the things that are wrong with that theme park of hate against Germans. Later yet, Cole came to Canada to lecture to large audiences on his Revisionist findings in Auschwitz, together with David Irving. He also appeared with Zündel in Munich, Germany, spreading Revisionism right under the watchful eyes of the German political police. In a vicious letter posted on the Internet, the Jewish Defense League threatened Cole's life. Emotionally fragile and torn between his conscience and family loyalties as well as filial devotion, he could not withstand the pressure and recanted with an abject apology to his tribesmen and tormentors. Every serious Revisionist understands that this act of recantation was coerced and may have bought David his very survival.